She sat there, paralyzed with fear. And she didn’t know where the fear came from, but she was aware she was more terrified than she’d ever been before. “You’re trapped,” the voice mocked, whispering in her ear. “God help me. Please deliver me from this nightmare I’m living.” Hopelessness surrounded her as she cried out to God. “Are you even real? I thought you were real, but where are you now, Jesus? Do you care about me? She and her husband were eighteen years old when they eloped. She had stars in her eyes while imagining what her picture-perfect marriage would look like. He would treat her with the same love and respect her father had given to her mother. He would cherish her and love her forever. What a fool she had been. Her marriage turned out to be the polar opposite of her fairy tale dreams and expectations. God answers our prayers and surprises us with good things, much better than what we can envision. We forget how well He knows us and how much He delights in us. God invites us into His throne room, where we can pour out all our concerns. He wants us to release everything to Him in prayer, just as we want our children to share their wants and needs with us. God is our Heavenly Father, our Abba (Daddy). He is Jesus, our Savior, and the Holy Spirit who dwells within us. Before the foundation of the world, God had planned what He wanted to do in and through me. 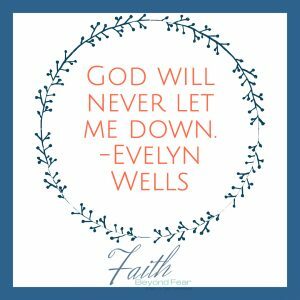 When it looked like my life would count for nothing, He watched me grow through hurt and hardship, letting me make decisions in which I had not involved Him. He was waiting on me to reach a point of desperation where I would call on Him. And, yes, where I would even doubt His existence. My situation didn’t immediately go away, but God restored hope. I prayed, “Jesus, please hold on to me. I’m afraid my hands will slip.” He held me, and I received comfort just knowing that. The peace I received gave me the determination to want to stay close to Him through Bible study and prayer. God delivered, or rescued, me and set me on a new path. Sometimes the path has been rocky and I stumble, but Jesus takes my hand and steadies me. Sometimes He even carries me. The fear, despair, and doubt have long since disappeared. They’ve been replaced by a growing faith and a desire to know my Lord better. As I’m getting to know Him better, I’ve come to realize what a Mighty God we serve. He will never let me down. My desire is to glorify God by living for Him and trusting Him. God is real, and He is faithful and true and loves each one of us with an everlasting love. He’ll deliver us from our times of doubt, our times of fear, and our times of despair, and He’ll set us on a new path if we’ll let Him. He’ll direct our steps, but we’ve got to trust Him. 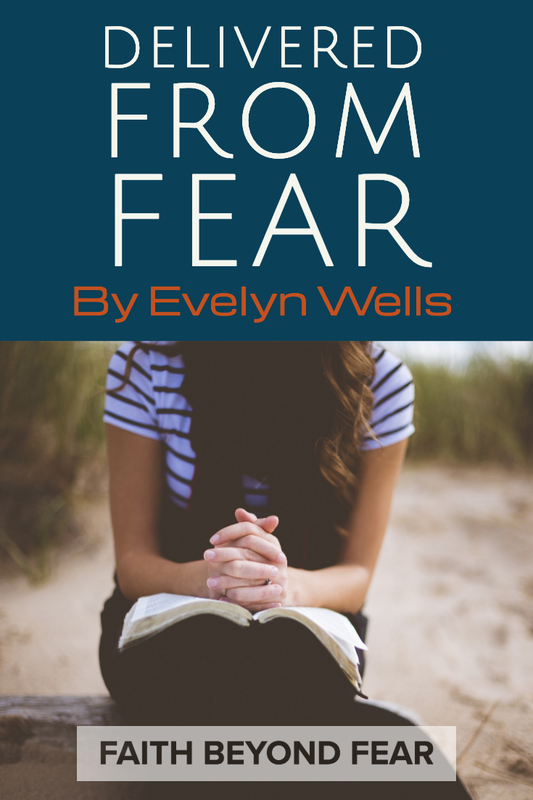 We don’t have to live with fear or discouragement, or any other thing the enemy throws our way. We do not offend God when we doubt. Jesus lived on this earth for over thirty years. He understands our struggles. God wants us to call on Him in whatever situation we find ourselves. He won’t tell us to get ourselves together or that the situation is of our own making. 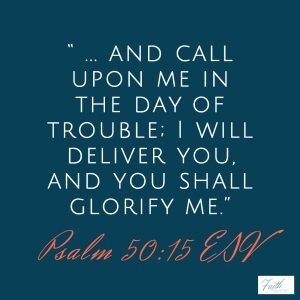 He wants us to call upon Him in our times of trouble. He is a big God, and He is greatly to be praised. Evelyn Wells is passionate about glorifying God through her writing which includes devotions, short stories, articles, and creative nonfiction. She writes for Refresh Bible Study Magazine. She has contributed to Breaking the Chains and Heart Renovation. She enjoys a good book, her two cats, traveling, and especially spending time with her children and grandson. She participates in short-term mission trips, both domestic and international. 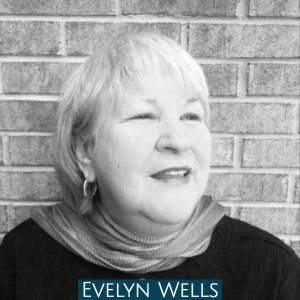 You can connect with Evelyn on Twitter (@venable_wells).